18ct gold gold ring made using customers own metal, three 6x4mm natural opals and 14 2mm round pave set diamonds and one 3mm round diamond from their old jewellery. Each opal is unique. When choosing opal for a ring remember that they are the most delicate gems commonly worn and you will need to be careful of how you treat it. The value of an opal depends on many factors: The type of opal, body tone, brilliance, pattern, colour bar thickness, the play of colour, and faults all play important roles in determining the value. When being valued,the opal is given a price ‘per carat’ weight based on these qualities. The overall carat size of the stone will then determine the price of the opal which can start at £250 and go up into the tens of thousands. Opal doublets and triplets are an ‘assembled’ stone which contain a thin slice of natural opal and are therefore less expensive. Given the delicate nature of opals they can be replaced in the ring easily if the stone becomes worn at a low cost. An opal doublet consists of a thin layer of precious opal, backed by a layer of dark-coloured material, usually either black opal (potch), or onyx. The darker backing emphasizes the play of colour. they tend to be flat on top. 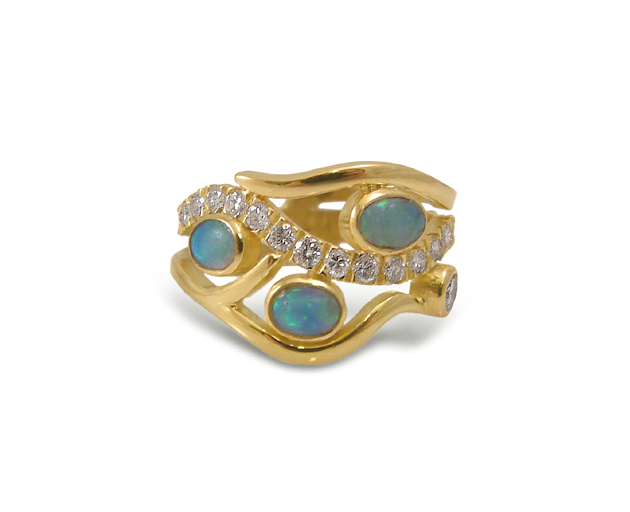 An opal triplet consists of three layers: A black backing as above. A thin slice of opal in the middle and a clear glass or quartz, capping in the shape of a dome on top. The clear capping serves to give the stone a nice cabochon or domed shape on top.